Home › Archbishop of Canterbury › Are faith schools really ‘selecting wealthy pupils by the back door’? The BHA’s involvement in Richmond is one example of its ongoing campaign against faith schools. The BHA is also a founding member of the Fair Admissions Campaign, which works to see the abolition of admissions criteria in state schools based on anything to do with religion. The Fair Admissions Campaign is made up of a coalition of organisations but if you look at its aims it looks incredibly similar to those of the BHA. This should go some way to explaining the motivation behind their research published on Saturday that concluded that Anglican, Roman Catholic, Jewish and Muslim schools are far less likely to reflect the economic status of families living in the local area than traditional community comprehensives. According to the findings 39 out of the top 50 most socially exclusive schools are faith schools. The data is based on the percentage of children in a school eligible for free school meals compared to that of those living in the local surrounding area. Those schools which have lower levels of free school meals have then been labelled socially exclusive leading to the spurious headline claiming ‘Faith schools ‘selecting wealthy pupils by the back door”. The problem as is so often the case is that this survey doesn’t tell the whole picture. Catholic schools in particular have wide catchment areas that are not reflected in the data. The Fair Admissions Campaign’s own website admits that pupils in Catholic schools are more likely to come from deprived areas. When a similar survey was done by the Guardian in 2012, the respected independent organisation, Full Fact drew the conclusion that whilst the results gave a useful insight they should only be considered in the context of their own methodology. Looking at the BHA and Fair Admissions websites you could easily be led into thinking that the majority of faith schools are highly selective favouring middle-class church attenders. However according to the Department of Education’s most recent figures, just over a third of all schools in England are designated as ‘faith schools’. 68 per cent are Church of England and well over half of these are Voluntary Controlled and may only have entry requirements based on religious faith if they are oversubscribed. 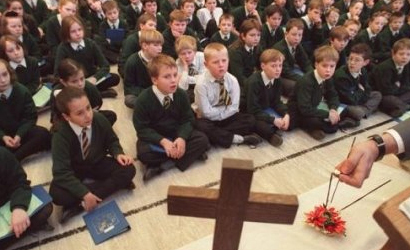 In fact new Church of England schools have been opened this year refusing to admit pupils based on their faith. Previously the Bishop of Oxford who is head of the Church of England’s education board has called on Church of England schools to admit no more than 10 per cent of pupils based on faith saying the church’s mission should not be about “collecting nice Christians into safe places”. In one sense this whole issue over selection policies is a red herring; a vehicle to give legitimacy to the BHA’s true aim of having faith schools abolished, which they explicitly state on their own website. There is a big leap of thinking required to go from criticising the entry requirements of some schools for being too complicated and narrow (despite being approved by the Department of Education and monitored by Ofsted) to deeming faith schools to be of no value whatsoever and better off extinct. But for the BHA the former is a step to seeing the latter accomplished. The Fair Admissions campaign and the BHA have a long way to go to win their arguments though. Last week also saw the publication of a substantial YouGov poll revealing what people ‘really think about faith schools’. 56 per cent of those who expressed an opinion thought that faith schools should be allowed to give preference in admissions to children and families who profess or practise the religion with which the school is affiliated. The study did find that 45 per cent of respondents thought that the State should not fund faith schools, but when these figures are broken down there is still support for Church of England schools. Those of non-Christian religions were judged much less favourably. Also faith schools received majority support from younger adults whose experiences of education are much more recent compared to older generations. Perhaps the most revealing aspect of the survey were the reason why parents would choose to send their children to a faith school. Only 3 per cent gave transmission of belief about God as an influence. Of much greater importance were ethical values, discipline and location. At the top came academic standards. The reason why many people complain about faith schools is not because of their religious ethos or faith values, but rather because most are popular schools that achieve good results and they want to get their children in but can’t. The dubious stereotypical practice of pushy parents starting to attend a church in order to gain places does little to help matters. The problem is not the faith schools or selection criteria in themselves. Instead it is the lack of places at these schools to meet demand. Closing or even abolishing faith schools will not help anyone and would be an incredibly rude snub to the institutions who founded the education system in this country. In contrast, the constant attempt to interfere and undermine the role of faith schools by some organisations appears to be motivated far more by intolerant ideologies than what might actually be best for children and their education. Surely children’s interests deserve to be at the heart of all of this? What is most ironic about this whole debate is that organisations committed to rationality believe such irrational things. The belief that faith based education is harmful to children lies at the centre of their argument. However the data shows the oppersite. The problem is there are not enough faith schools providing high quality education. Their objection is based on a fear that faith schools indoctrinate children, again the data shows the oppersite and Ofsted monitor these schools too. It is disturbing that claims such as “bringing a child up as catholic is more harmful than child abuse” (God Delusion p356) lie at the centre to their objections. Where is the data to back up such a claim. What is worrying is that such claims are not challenged imagine if anyone else said this? Education policy must be based on data not the irrational fears of few. There are many examples of poor practice in our faith schools and it is vital that we are willing to accept, acknowledge and address this where it takes place. If we cannot do so, then the risk is the good work of the many will be hard to defend. Some of these schools have become a place for wealthy families, more due to demographic change, and the loss of the bias towards the poor within the church, than any intent on behalf of the schools themselves. Education provision does not stand alone, and the church has limited resources. However taking the 7 spheres of influence in society (as one model), many of our church bodies are weak in several of these spheres, which reduces our capacity to be heard still further. Although there are many church schools, the link between some of these and the churches is far from robust, particularly at a secondary level. If we simply attempt to defend the right to have church schools, as the church did over the debate on marriage, we risk losing what we have. If on the other hand we can work strategically, address our failings where they exist and strengthen the church to be more what it is meant to be within society including in the political realm, then perhaps we will be able to strengthen what we have, not lose it. This is a great post thank you. I do have a slightly different perspective on your comment about ‘the dubious stereotypical practice of pushy parents starting to attend church in order to gain places’ though. I have a very good friend who became a Christian as a result of attending church to ensure place at our local C of E school for her child. Her life has been transformed as a result, as has that of her family. I think that anything that could result in people choosing to put themselves in a place where they will hear about the love of God is a positive thing, even if it means that my children could be less likely to get a place at an over subscribed faith school. I also feel that the quote that you included from the Bishop of Oxford is a rather sweeping statement about the motivation for those setting up, leading or attending faith schools. While in some quarters this may not be entirely unfounded, my experience is that there is a great deal of outward motivation, about training and equipping young people to shine a light into their community and beyond, in order to bring about much needed transformation in our communities and society. Thanks Ali. Your points are very welcome. That is very good news about your friend. I am actually quite happy that one of the consequences of these policies is that more families attend church for the reasons that you give. The system is far from perfect and come away disappointed, but that doesn’t mean that there is also a lot of good in it too. The BHA might not see people becoming Christians such a good thing though! I have noticed that, in this debate about faith schools, a radical question always needs to be asked: who has responsibility for a child’s education — the parents or the State? The answer to this must be both. This is fulfilled by the parent being able, as far as is practical, to choose a school whose values reflect the views of the parent, and the State specifying the curriculum. I think there is something of a deceit regarding choice in public services. Choosing Schools is only realistic if there is a clear distinction between them based on culture and they are equal on the qualitative elements. As we know most of the criteria set and measured by the state is about the quality of provision. The idea that I would choose a ‘worse’ school simply because it offers a focus on one specialism or another (including that of faith) is simply absurd. Choice, where it did exist disappeared once league tables were created. What a parent feels is a worse or a better school depends on the parent’s values. A school is expected to prepare a pupil for life with regard both to character and academic achievement. I imagine that many Catholic parents would put a high value on character but not at the expense of choosing a school with poor academic results. This is not usually a problem with Catholic schools, which generally satisfy on both counts. As a parent with two children in school, and one who will begin in September 2013, I do not see things in quite the same way as you do Ian. I don’t remember looking at league tables to inform my decision. I did look at Ofsted reports, but with an awareness that these reports do in part reflect the particular experience and specialisms of the inspection teams. Our decision on schooling was based primarily on the visits that we made to the schools in our area, and the discussions with the head teachers (and pupils in some cases), the values and expectations of the schools and their ethos and philosophy. A school with a very poor reputation locally (primarily based on its location and the demographic of its intake) appeared on our preference list for the above reasons. There are many different reasons for a family to prefer one school over another, and it is up to each family to decide on their priorities. Of course this is limited to what is available locally for most people, but not to the extent that you indicate here. What you regard as ‘worse’ based on achievement on a league table, may not be regarded as such by everyone. Hi Ali and Quentin, my comments were not intended to suggest that all parents adopt the approach I have suggested, but merely that many do. I personally experienced a dilemma when my own two children were at the deciding stage. Brighton is well placed with a very popular RC School and a number of other Schools. Each School has its merits, but what is clear is that there are some Schools which are unpopular. This has led to first one and then another and then a third being the Schools to avoid. This is the worst sort of choice, and of course means that parents play tactical games to ensure that even if they cannot have their preference that they avoid the sink School. I accept that many church Schools are very successful, but particularly at the primary level some are far from this position. My own children attended a School which we chose on the basis of the right thing to do. Whilst we would not have chosen differently, the cost was not insignificant for them. My comment was to challenge the concept of choice and what limited tools exist to choose on grounds I would hope we all agree would be good criteria in many places. I’ll just sign off by saying that I am glad this is only an historic problem for me. My youngest will be 50 in a couple of years. God bless all. The B.H.A somehow make faith schools sound like educational theocracies but in truth there is not much difference between a community school and a faith school when it comes to ethics which are generally informed by Christianity which is mainly the importance of being kind and considerate to one another. RE. is still a very small part of the curriculum and in a lot of faith schools it is common for pupils to reject the idea of God so they are not really the bastions of indoctrination that the B.H.A. would have us believe. In a local community primary school the ” open the book ” programme was stopped due to pressure from a small number of humanists who deemed it to be indoctrination and despite a petition from parents who wanted it to continue. Open the book is not evangelism just bible stories which illustrate a moral message. So the agenda is not limited to a dislike of faith schools but the place of religion within education in general.. Is this common to other schools across the country i wonder. Thanks Graham. Theos have released a report on faith schools. Its findings are in line with what you’ve said and also my article. 1. The challenge to the Catholic school in Richmond was not initiated by the British Humanist Association. It was led by RISC, a large local campaign of people from a wide range of backgrounds, including some Catholics. Like the Fair Admissions Campaign, we have never argued against faith schools per se – some supporters are for them and have their children at them, others are opposed, some strongly so. But RISC’s focus is solely on the issue of discrimination in admissions. We therefore never objected to the fact that the new school in Twickenham was Catholic, but to the fact that it has the most exclusive type of admissions legally allowed (up to 100% faith based) and that Lord True’s Council gave away a rare and valuable site in the centre of the town to a school that will become effectively closed to 85 to 90% of local children. The judicial review in which we welcomed the participation of the BHA was on the legal point of whether, following the Education Act 2011, the new schools should be Voluntary Aided (allowing 100% selection) or Free Schools/Academies (max 50% for new schools). RISC made no objection at all to a new CofE primary school that opened nearby at the same time (St.Mary’s Hampton) because it has, to its credit, fully inclusive admissions. 2. According to a 2012 OECD report (School choice and equity by Pauline Musset), the only other OECD countries that have faith-based discrimination in admissions to state-funded schools are Estonia, Ireland and Israel. We are a real outlier. 3. The Fair Admissions Campaign’s analysis based on free school meals is entirely valid. It gives the same message as the Guardian’s 2012 analysis. RISC has looked at our local primary schools (no argument about large catchment areas there) and found exactly the same – we have examples of church schools very close to community primaries with radically different free school meal percentages, and the averages for church schools are lower than for community schools. The data are pretty clear – church schools with faith-based selection are socio-economically selective. Of course, there are excellent faith schools and excellent non-faith schools. We have local schools in both categories. There is also plenty of research evidence to show that the principle cause of good performance of faith schools is their selective intake. So this is about both faith-based and socio-economic discrimination and privilege at schools which are almost entirely taxpayer-funded – an ethical issue. What would Jesus say? Thank you Jeremy for taking the time to respond to this. I always seek to check the details as thoroughly as I can, so I apologise for any inaccuracies. I too have serious concerns about any school that has 100% selection but as you know this is only possible if a school is oversubscribed. The free school meals analysis is correct, but not necessarily the conclusions It does not prove that schools deliberately target more wealthy children or discriminate against poorer ones. The causes need to be examined and not just the effects along with other data. We can all try and use statistics to our advantage if it suits us. The problem with the RISC working with the BHA is that it gives the impression that both are working towards the same goals. The BHA is publicly anti-faith schools and seeks to have them abolished. By aligning RISC with the BHA then some of the welcome points you have raised are lost. This certainly appears to have been the case from the media coverage. The Bible tells Jews to bring their children up in the faith and to teach them its laws. I am sure Jesus would want to see schools that look to teach the Christian faith with understanding. He may well have a problem with the way our education system is run and many Christians (including myself) would want to see schools that are more inclusive, but surely if demand is so high even from those of no faith then we should be looking to have more faith schools not less. During the battle about the new Catholic secondary school, he proposed a compromise of a max of 50% faith-based selection for the new school. RISC would, reluctantly, have accepted that. But it was rejected out of hand by the Catholic Diocese, supported by Lord True, who insisted on 100%. The government supported them in getting it. While the aims of RISC and the national Fair Admissions Campaign are not identical to the BHA’s, we welcome their support. The Fair Admissions Campaign is also supported by the BHA but also by Ekklesia, a Christian think-tank, the Accord Coalition (chaired by Rabbi Jonathan Romain, who is one of the leading figures in the FAC), Prof Ted Cantle, probably the UK’s leading authority on community cohesion, British Muslims for Secular Democracy, the Hindu Academy, the Unitarians, the Runnymede Trust, ATL and a number of others. One of the reasons for the impression you may have gained from the media is that, in the Richmond case, there was, and continues to be, a deliberate attempt to portray RISC as “anti-faith”, as that makes it easier to evade our core question of fairness. Our lack of objection to the inclusive new CofE school in Hampton clearly demonstrates where we’re coming from, but is conveniently ignored. This tactic is particularly irksome for active supporters such as the person who lives near the new Catholic school and is married to a Catholic, or another who is an active Anglican. Even for me, as a humanist but one who is active in “inter-faith” dialogue and other activities – and certainly not a “Dawkinsite” anti-theist – this tactic is frustrating and simply adds to the drive to fight for fairness. As far as I am aware, the vast majority of RISC supporters do not care at all about religion (or humanism for that matter) but just want fair access to good local schools. Thank you. It’s really valuable to hear these things from the horse’s mouth so to speak and gain a better understanding of what you are trying to achieve. Apologies for typo – called you Gillian! Don’t worry. I am so used to that now. I tend to be more surprised when people get it right! I think that RISC may have been more successful in the local community had Jeremy Rodell not fronted it. He is chairman of the South West London Humanists and actively participated in the ‘Protest the Pope’ campaign. He has been campaigning against a Catholic secondary school in the borough for years – way before any admissions policies were known. I think that this has made many in the borough very wary of his objectives – particularly when there is a long and popular history of primary faith schools in the borough. For what it’s worth – my son, who is of no particular faith is loving the school and has been made to feel very welcome. It is hard to see how RISC could have been more successful in the local community. RISC’s aims were defeated by a combination of the power of the local Council, plus local Catholics, supported by the Catholic church, and the intervention of the Department for Education, itself reflecting the influence of the Catholic church, which had secured a legal loophole in the rule that new faith schools must have a max of 50% faith based selection. It’s hard to see how any local campaign could overcome those odds. RISC made it clear that it would reluctantly accept the compromise of a Catholic school with up to 50% faith-based selection as proposed by Vince Cable. That compromise was rejected by the church, who wanted 100%. “How can it be right for a child to be turned away from a local state-funded school simply because of their parents’ religion or beliefs?” Maybe you’d like to have a go at answering it. RISC is not asking for there to be no faith schools – many are indeed popular. It is arguing for fair access to these state-funded schools, just as everyone expects access to other state-funded services without faith-based discrimination. 1. I did not actively participate in the Protest the Pope campaign apart from one open meeting held at Richmond Reference Library on 12 Aug 2010, also attended by many Catholics, which was organised by the Protest the Pope people. I did so in order to draw attention to the newly-elected Council’s proposals for a Catholic school, which, by definition, would be highly exclusive (almost every Catholic school in the country has up to 100% faith based over-subscription admissions). I had no other involvement with the Protest the Pope Campaign. 2. The 12 Aug 2010 meeting was the first action I took in respect of a Catholic secondary school in the borough. A few months later – in December 2010 – the Council issued their strategy committing them to a Catholic secondary. RISC got started in April 2011. I’ve always been proud to chair SW London Humanists since it was founded in 2007. I am certainly not anti-religious (another accusation bandied around), in fact I’m about to spend a weekend at a Catholic-organised dialogue on values and ethics between religious believers and humanists. Richard Dawkins I ain’t! While I lead RISC, the vast majority of its supporters are not – as far as I know – humanists. Of course it includes people who are against faith schools, and even some who are anti-religious (we always deleted any anti-religious postings on our Facebook site), as well as those who are for faith schools and have their children at them, and people who themselves religious, including some Catholics. I look forward to seeing the answer to RISC’s key question. No child is turned away from a Catholic school simply because of his or her parents’ beliefs.Catholic schools which have places not taken up by the Catholic children (for whom they were founded and in part financed) accept children of any, or no, denomination. That’s a disingenuous reply. By law no school can refuse a child if it has unused places, and any school with unused places wants to fill them because of the money. But once a Catholic school is fully subscribed, no non-Catholic children can get into it. Children from Catholic families living miles away have a higher priority than a non-Catholic child living across the street. Of course, in many cases their parents don’t even both to apply as they know it’s hopeless. I even know of cases where a non-Catholic child has secured a place at a Catholic primary school but their younger siblings will be turned away because the subscription level has gone up. Meanwhile the taxpayer funds 100% of the school’s running costs, and 90% of the ongoing capital costs (100% in cases where the school has converted from Voluntary Aided to an Academy). Now please answer the question. You demanded an answer to a question which contained a false implication. I gave it to you in your own terms. The issue of faith schools is too complicated to be dealt with through simplistic questions. – as I expect you know. This is a simple question about basic equity. It’s not “simplistic” any more than the identical question would be but with parental skin colour rather than religion, or about hospitals rather than schools. From the viewpoint of those who are unjustly disadvantaged, it is the key question. “Simple questions” such as yours are more usually the province of a prosecuting counsel trying to trap a witness. I will answer the question as you should have put it, had you been interested in a meaningful answer. Given that all the parents concerned have paid equally through their taxes, it is right for a school which has been set up to provide a Catholic education to give preference to a Catholic child. The key feature of the question is that it looks at the issue from the viewpoint of those who are being discriminated against, rather than those who are benefiting from the discrimination. And you don’t have an answer to it. The only difference is that those cases would be illegal. Indeed, faith-based discrimination in access to state-funded schools does not occur in most other developed countries, including Catholic countries such as France, Italy, Spain and Poland, as well as the US, Canada, Australia etc. We are very unusual. Sooner or later, a government will have the courage to put it right. Jehovah’s Witness in fact present rather a good example. You will know that their beliefs preclude the use of blood transfusions. Nonsense in my view, but then I am not a Jehovah’s Witness. I admire their courage. Of course it would not be practicable, because of their relatively small numbers and wide spread, for them to sponsor a hospital or a medical centre within the NHS which does not give blood transfusions, and would specialise in the medical alternatives. But, if it were practicable, it would seem commonsense to allow them to give Jehovah’s Witnesses priority. In fact the NHS does recognise their needs and St George’s Hospital in London publishes information on such alternatives, thus recognising and respecting their consciences. For the same reason I suppose that they are willing to undertake the extra work and specialisms involved in order to meet the need. Yes, in this country we are unusual since we value highly the freedom of minorities. I hope that it stays that way – although the “one size fits all” busybodies are becoming more influential. France and America, of course, owe their secularity to their respective histories. Your “white children” is irrelevant. There is no reason why white children should require a special education. There are very good reasons why Catholic parents should want their children to have a school which respects Catholic values and beliefs. So still no answer to my question. Please try to look at this from the point of view of non-Catholics. They don’t care whether someone wants or doesn’t want a special school just for themselves and their co-religionists. They care that they are denied access to a state-funded school to which they may want to send their children – perhaps because it’s the nearest primary school – simply because they don’t have the “right” religion.The point about white children is precisely analogous from the perspective of non-white children. I agree that one size doesn’t fit all – and in practice no two schools are the same. Catholic schools will always, on average, be more attractive to Catholic parents than to non-Catholics – that’s already a privilege. But parental choice depends on a level playing field. Right now, in many places, Catholic parents have a far wider choice of school than non-Catholics because of faith-based selection. They have absolute priority at Catholic schools, and often get a degree of priority at Anglican schools, but at the same time they have the same priority as everyone else at community schools. Would you support an apartheid-type system system in which Catholic families were denied access to all fully-subscribed non-Catholic state schools? While I doubt whether any answer I gave them, or – for that matter, you – would satisfy, I would explain to the open minded that because Catholics are about 10% of the population their schools need to have a larger catchment area in order to fulfill their function. They are not strictly comparable to secular state school provision – which is intended to cover the other 90%. That would be fine were it not for the fact that they are state schools, and again fails to see the issue from the point of view of non-Catholics. The implication of your last reply is that you would support such an apartheid system. Is that right? i think that we are now wasting each other’s time. And anyone following this exchange (few I imagine) must be bored to tears. If you really want to discuss the issues you have in a normal way, email me via editorial@catholicherald.co.uk — and ask for it to be forwarded to me. My name appears in a reply above. Similarly, if you’re interested in pursuing the topic (or even giving answers to the questions) then please contact me on communications@richmondinclusiveschools.org.uk. I should stress, by the way, that disagreement on the issue of faith-based selection should not preclude finding common ground on other issues.